Perfect for 3 couples or a family. You will love it for its location and style. It opens an elegant and original apartment, whose careful rehabilitation will seduce you with its charm and comfort. Ten minutes walk from the Art Walk (Museums Prado, Thyssen and Reina Sofía, CaixaForum, Arqueológico Nacional, Fundación Mapfre. Recoletos Room, Casa de América, Palacio de Cibeles, Naval Museum, National Museum of Decorative Arts, Royal Botanical Garden, Royal Observatory of Madrid. 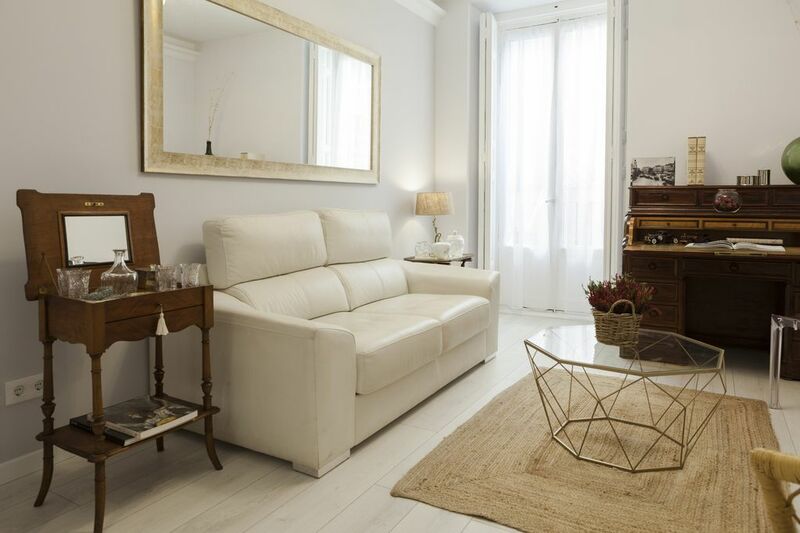 Six minutes from La Puerta del Sol, the zero kilometer of Madrid. In the neighborhood of theaters. 99 m² Recently renovated, it opens as a tourist accommodation. The apartment consists of three bedrooms, the main one with balcony and en suite with dressing room and a modern bathroom, another double and a third with a trundle bed. The second vintage style bathroom, serves these two bedrooms. Full kitchen with dining area, incorporated into the living room that has another balcony. It is elegant, comfortable and quiet, given that the neighborhood is restricted to resident vehicles and the street does not allow parking, so there is hardly any traffic. Neither are there bars so close that they prevent rest. I offer capsules of coffee, tea, infusions, Cola Cao, juices, milk, sugar, buns and sweets ... everything you need for a good breakfast. If you want, I can pick you up and take you to the airport or station. Give them the directions you need from the city. Help with public transport. Recommend restaurants, shops, shows. Count on me for whatever you need. I will leave maps of the city, transport and the most important points of interest. You will find reading about the most important attractions of Madrid and other Spanish cities. There is a world map in which guests leave evidence of your country of origin and a map of the area so that you can locate the points of interest without any problem. The building is from 1876 and has just been rehabilitated in its structure and infrastructure. These works have already been completed in full, but the lift is not yet operational, although it is scheduled to start up in the coming weeks. The apartment is on the first floor and there are few stairs to the access. It is a quiet neighborhood community, so you have to avoid noisy events. You will find the written instructions, the WIFI key (optical fiber), operation of the appliances, etc. All the textile of the house, both bed linen and towels, are 100% Egyptian cotton sustainable and of extra qualities, to achieve maximum comfort. The apartment is located just behind the Teatro Apolo Nuevo Tirso de Molina, opened in 1840 and dedicated to one of the great dramatists of the Golden Age, Fray Gabriel Téllez, better known as Tirso de Molina, whose statue adorns the center of the gazebo. A few meters away is Casa Patas, a tavern of reference with flamenco tablao, whose visit is essential to enjoy FLAMENCO live and the MEDITERRANEAN DIET, declared Intangible Cultural Heritage of Humanity by UNESCO. It is also the Theater District: this is the name of a cultural project to promote theater that brings together fourteen different spaces in form, spirit and content, and managed by teams or people with very different projects. Among them you can find from the Teatro Calderón, La Latina, Figaro, Spanish, Pavón, Nuevo Apolo, El Escondite, El Umbral de Primavera, Valle Inclán (one of the headquarters of the National Drama Center), to the Teatro del Barrio, passing through Casa Encendida, Sala Mirador or Jacob's Ladder, among others. The Ópera de Madrid and the Teatro Real are a few meters away. It is Lavapiés, one of the oldest neighborhoods, which in the past was the Jewish quarter of Madrid, in whose square there was a fountain in which the Jews carried out the ablution and washed their feet before entering the temple. Near Lavapiés, whose cultural diversity and multiplicity of colors, flavors and smells is one of the main characteristics of one of the oldest neighborhoods in Madrid. And the mixture of ethnicities and cultures makes Lavapiés a unique neighborhood. It is said that more than 88 nationalities coexist in a framework where numerous cultural activities take place and where you can try the most diverse dishes in bars and restaurants. His story is, at least, fascinating and know it, I'm sure it will not leave you indifferent. Gracious check in - very clean and comfortable! A bit noisy in the front bedroom, being on the street - but perfect location to walk anywhere! Newly renovated beautiful bathrooms, Highly recommended! Please read the reviews that have already been posted. We did, and based upon them, chose this apartment to stay. Everything is spot on. The photos are very accurate to the apartment. Sol, the owner, is very helpful and happy to engage with you both before and during your stay. The apartment is located all on one floor, in the progression from right to left: small bedroom, medium sized bedroom, bathroom number one, master ensuite with bathroom number two, kitchen with dining, and living room. The location is ridiculously convenient and very safe. You are in walking distance to all of the major sites, as well as easy access to the Madrid metro, which is among the best in the world. The only negative is that garbage collection occurs around 1 a.m. every morning on the street immediately outside the master ensuite and living room. This can be quite loud, as can be people dragging their garbage cans back into their buildings throughout the early hours of the morning. We recommend using a white noise application on your phone, and this can be mitigated. The interior bedrooms do not have this problem. Good luck on your visit to Madrid! Thank you Sol for a lovely vacation. Wonderful host, reliable and easily accessible. Modern apartment in a historic building. Comfortable apartment 20 min walk from all the essential attractions. Highly recommended. Great apartment near Centro. Would definitely stay again. The place is great, spacious and very clean. It was perfect for my family of 5 to see Madrid. Sol provides everything and was very flexible in allowing a late departure. We would stay here again. The only minor negative is the street can be a bit noisy during the night and the Calle de la cabeza is a bit dirty. Very good location and convenient to the Plaza Mayor.